I mentioned a few weeks ago that I signed up for a food photography class and promised to fill you in on the experience – well that long awaited day is here along with some pictures from the four day workshop! The class was offered through the International Center for Photography and taught by Susie Cushner, an amazingly talented food and still life photographer. Seriously, her level of knowledge and attention to detail are incredible – what she can do transform light with a few foam core cards and a black curtain are something to see. Each day I’d come home, brain tired and spinning from all the information it was trying desperately to retain! We were also fortunate to have the gifts of Nancy Adler, TA and student whisperer, and food stylist Dana Bonagura at our disposal. 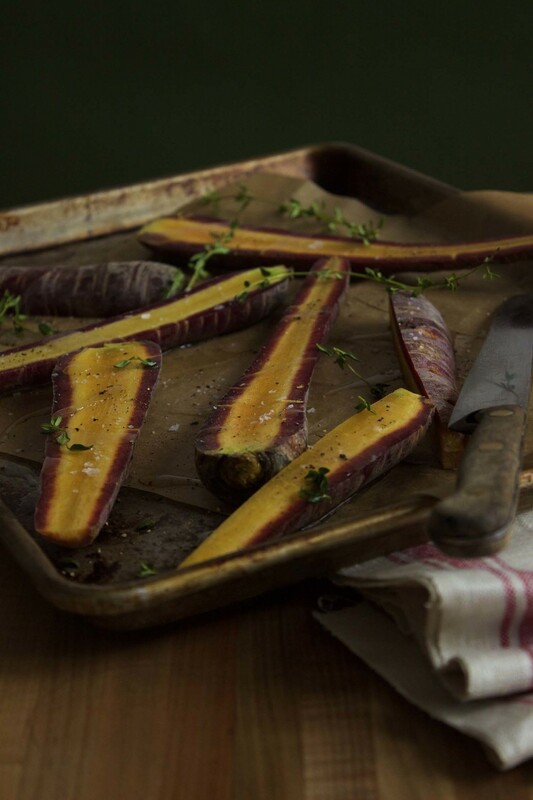 Dana was on hand during our studio shoots to help us translate our ideas – in my case something vague like “moody vegetables about to be roasted” into beautiful, natural compositions. My fellow students were fascinating too and the diversity of backgrounds – two chefs, a photographer’s assistant, a photography student, a photography professor, a non-profit communications professional, a blogger, and an event photographer – nationalities, and levels of experience added so much to the discussions. I was lucky to be paired with Margarita Garcia – a much, much more experienced photographer and thankfully one who was so patient with my scramble up the learning curve. Watching her work and talking through the process with her was fascinating; I began to understand the kind of meticulous mindset that professional photographers are in during a shoot. 1. Understand the basics. Aperture, Shutter Speed, ISO, White Balance. Read about these concepts or better yet watch a ton of YouTube videos until you know them cold. 2. Know your equipment: being familiar with how to change the settings. This video was particularly helpful to me because it used the same model camera I have. 3. Consider the subject. What will you be photographing? Will the shot be of whole ingredients, process, the finished dish, a plated portion? What do you want the viewer to take away from the shot? 4. Consider the composition. How will you frame the shot? How many elements will be involved? Don’t ignore the edges or corners – as Susie reminded us the edges are where things get interesting. 5. Think through the styling. Is the tone rustic, formal, modern, natural, structured? Is it in the kitchen or on the table? How do the props (vessels, linens, utensils, etc.) contribute to telling the “backstory” of the shot? Susie’s mantra: the magic is in the details. 6. Observe the light. What mood or time of day do you want to convey? What shadows and highlights are present? Does the light help to capture the texture and color of the subject or are some adjustments needed? 7. Adjust, adjust, adjust. A small tweak here, a nudge there – continually make small changes until you get the shot you want. Repeat after me: the magic is in the details. 8. See what You see. Bring your personality and perspective to the final shot. Already I can see the ways that these takeaways lessons are informing the way I approach food photography. It takes an amazing amount of energy and focus to create even the most simple shot and I have such great respect for the professional photographers, food stylists, and prop stylists in this field.